You can vote once each week! Hi, its Maria Long here from Close to Home, sharing how this mom deals with leftovers from the holidays. We purchase a full ham twice a year, at Christmas and Easter. I usually buy one that is too big for our family and as much as I would like to force my children to eat ham for a week straight, I end up throwing too much away. This year I decided to make Ham and Pineapple packets with the leftovers. By storing them in Reynolds Wrap Foil they won’t get freezer burn and they can go from the freezer straight to the oven. I am making individual packets for a quick meal on the run when the kids start craving ham again! 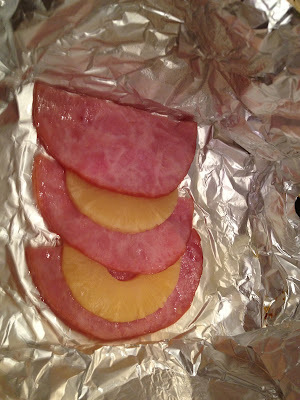 Inside a piece of Reynolds wrap, alternate pieces of ham with pineapple slices. We used the canned variety. Seal into a perfect package making sure all sides are sealed. This is what prevents the food from getting freezer burned. Ready to go in the freezer. They take up less room than your traditional plastic containers. See how by watching this short video. When you are ready to heat the ham, just take it out of the freezer while you are preheating to 350 degrees and heat for 30 minutes or until inside is warm. They will get caramelized if you throw them on the grill if it is too hot to put on the oven. Another item we have left over during Easter are those bunny marshmallows aka Peeps. They get stale the minute you open the package. This year I am making Peep smores for the kids to have ready when they need a snack or dessert in a pinch. Simply assemble your s’mores using the bunny marshmallows in Reynolds wrap foil; I made two in each piece. They are ready to go in the oven, 350 for 10 minutes or so or right on the grill for about 5 minutes. You can even store them for a short period in the pantry. That’s how this mom deals with leftovers over the holiday. Caught him red handed, there is the extra Peep he used in the microwave! Wednesdays are the only days to vote for Maria Long on Reynolds Real Moms. . Remember you can vote weekly and watch my videos too but you can not vote via a mobile device.…. Thanks for your support and please check out the tips these great ladies are sharing. ALSO DONT FORGET I am giving away ANOTHER 6 month supply of REYNOLDS WRAP PRODUCTS. This is a new giveaway so be sure to enter even if you entered the first one!! 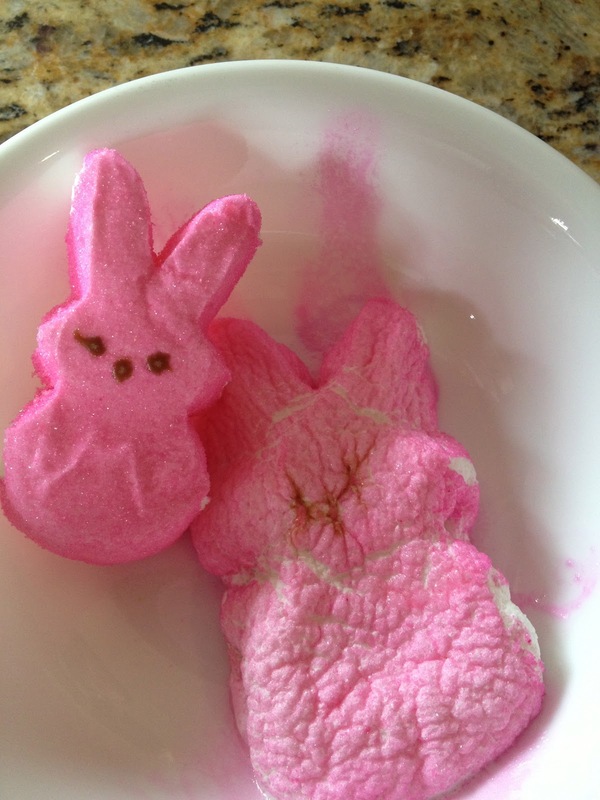 Leftover Peeps? Not in my house with two ravenous, sweet-toothed boys! But… Those S’mores look so yummy, I (ahem, I mean the Easter Bunny) may have to add some extra Peeps to the baskets this year and hope there are still a few left for me to try this! individual packets for a quick meal on the run sounds great and those smores look amazing! What a great idea!! My husbands favorite food is ham so we definitely need interesting ways of eating it. I love the idea with the peeps. Sounds yummy. Isn’t that smart! I love the Peeps Smores! Seems like peeps multiply overnight & no one knows what to do with them, this is a great idea. Thank you for sharing. Peeps Smores, duh! That’s genius, lol. Thank you!